The parish includes a variety of villages and hamlets in the north part, the chief of which are Bourn Heath, Great and Little Catshill, Lickey End, Sidemoor, Upper Catshill, Long Eye, Marlbrook and the Rock. All the preceding villages and hamlets are also listed under North Bromsgrove. The marriage register for 1754-76 is missing. 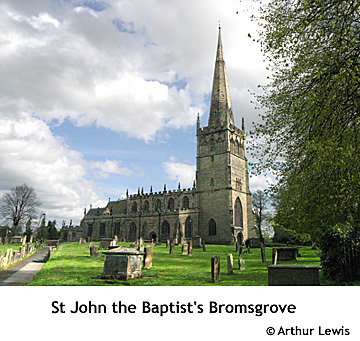 BROMSGROVE (St. John) : Monumental Inscriptions [Microfiche.] Published Birmingham : Birmingham & Midland Society for Genealogy & Heraldry, Nd. Author Townshend, Jenny et al. (trans.) Source D: Quemby bequest. Access to the library edition of Ancestry.co.uk is widely available at most record offices, including Worcestershire Archives, and some libraries. You are advised to book time on their computers before making a visit. A free-to-view site is being developed at freecen.org.uk for the 1841, 1851, 1861, 1871 and 1891 censuses. Coverage of Worcestershire parishes is rather sparse at this time. Census returns can usually be viewed at Church of Jesus Christ of Latter Day Saints' Family History Centres. Alfred Edward Housman [1859-1936]; supplement to the Bromsgrovian, 1936 : in Family history tracts, vol. 64 IN: The Bromsgrovian, 1936 Published , 1936 Author Symons, Katharine E et al. Edition 3rd edn. Bromsgrove School memorial chapel Published : Bromsgrove School, Nd. Bromsgrove School, Worcestershire; founded 1553, refounded & endowed by Sir Thomas Cook, Bart., 1963 : school lists July 1911 to autumn term 1917 Published Bromsgrove, Nd. BROMSGROVE, a market town and parish (formerly a borough) in the upper division of the hundred of HALFSHIRE, county of WORCESTER, 13 miles (N.E. by N.) from Worcester, 13 (S.W.) from Birmingham, and 116 (N.W.) from London, on the road from Birmingham to Worcester, containing 7519 inhabitants. This place, anciently Bremesgrave, was a royal demesne at the time of the Conquest, and continued to be so till the reign of Henry III; it returned members to parliament in the 23rd of Edward I. During the parliamentary war it was the head-quarters of a party of royalists employed in the siege of Hawkesley House, about three miles distant, which, in 1645, was fortified and garrisoned by the parliament. The town is pleasantly situated on the western bank of the river Salwarp, and consists principally of one street, extending for a considerable distance along the turnpike road: the houses are in general substantial and well built, and the inhabitants amply supplied with water. The principal articles of manufacture are nails, needles, and fish-hooks; and some coarse linen table-cloths and sheeting are still made: in the neighbourhood, potatoes, for the Bristol and other markets, are extensively cultivated. The Birmingham and Worcester canal passes within three miles to the east. The market is on Tuesday: the fairs are on June 24th and October 1st. The town is within the jurisdiction of the county magistrates; a bailiff and other officers are annually appointed at the court leet of the lord of the manor, held at Michaelmas; and a court is held every third week, for the recovery of debts under 40s. The town-hall is a neat and commodious building, under which is a marketplace, in the centre of the town. The living is a vicarage, with the perpetual curacy of King's Norton annexed, in the archdeaconry and diocese of Worcester, rated in the king's books at £41. 8. 1 ½ and in the patronage of the Dean and Chapter of Worcester. The church, dedicated to St. John the Baptist, is a very ancient structure, combining portions in the Norman style, and others in the early, decorated, and later, styles of English architecture, of which last the tower and spire, and most of the exterior of the church, are fine specimens ; the interior contains many curious and interesting monuments. There are places of worship for Baptists, Independents, Wesleyan Methodists, and Unitarians. The free grammar school was founded, with an endowment of £7 per annum, by charter of Edward VI, confirmed by Queen Mary, who vested the management in governors, whose appointment of a master is subject to the approval of the bishop of the diocese. The original endowment was augmented with £50 per annum by Sir Thomas Cookes, who in 1714 founded six scholarships, of £50 per annum each, in Worcester College, Oxford, for this school and four others in the county; and six fellowships, of £ 150 per annum each, in the same college, to which, as vacancies occur, those who hold the scholarships succeed. There are twelve scholars on the foundation, who are clothed, educated, and apprenticed: they are entitled to the scholarships and fellowships above mentioned, but the master's private pupils usually enjoy the benefit of them. There are some endowed almshouses in the parish. At Dodford, two miles from the town, are the remains of a small priory of Premonstratensian canons, founded by Henry I in 1190, now part of a farm-house. At Shepley there are some traces of the Roman Iknield-street; and near Gannow is a petrifying spring. To the north of the town is Bromsgrove Lickey, a range of lofty hills, commanding an extensive and diversified prospect of the surrounding country; a considerable part, comprising a tract of two thousand acres, has been enclosed, and produces good crops of clover, turnips, and potatoes. A spring, rising among these hills, divides into two streams, one of which flowing northward, joins the river Rea, and uniting with the Trent, falls into the North sea; the other, running into the Stour, joins the Severn, and empties itself into the Irish sea.